Yesterday was a bitter-sweet night for all of us. 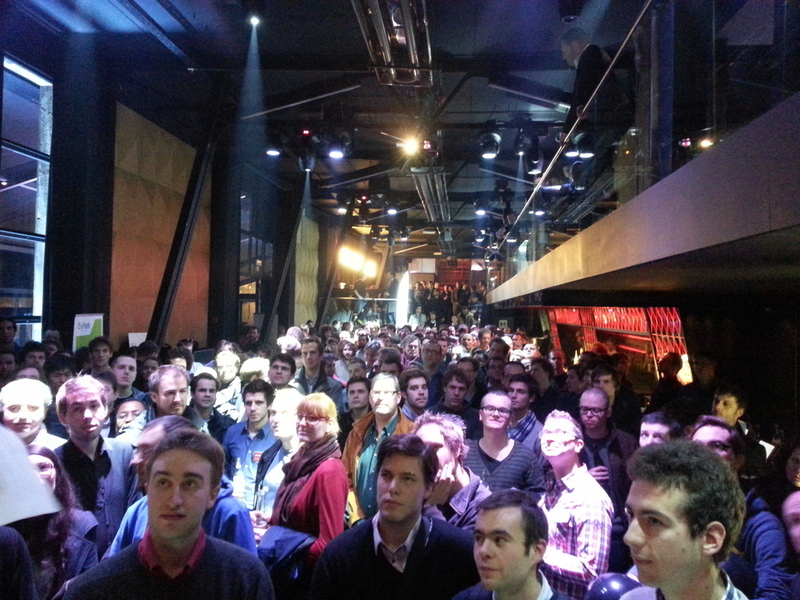 On one part we had the first demo day of the Betagroup, with almost 1200 signups and over 700 attendees. The place was packed and the startups doing the demos where very busy pitching. At the same time Leo Exter was running a Betainvest event upstairs, with 30 investors an 10 startups pitching for funds. Jean Derely got on an improvised stage to thank the sponsors and go through all the things that have happened in the last 4 years, and then proceeded to drop the bomb: Jean will no longer run the Betagroup. I cannot say it was a surprise for me or the other members of the Betagroup team (we had been working on his decision for about a month), but it was still a sad moment for me. Without Jean and the Betagroup I would have never become who I am in Brussels and the startup ecosystem. I don’t think I would even be the same person, nor have reached my current level of happiness. If I’ve ended up organizing so many events and opening a coworking space in Brussels it is part thanks to Jean, to his motivation and to the vibe he’s managed to transmit. He’s sparked the will to organize things and to make them happen in a lot of us; he’s promoted and helped numerous events and groups to get going, to launch and to do what they love; he’s shown the example to follow, doing what we love, working hard, making it happen. Jean is the heart and soul of our tech startup ecosystem. He’s not the only one that has created or is running events to promote tech entrepreneurship in Belgium, but he’s had the biggest impact of all. Jean has always focused on bringing value to the startups and obsessed about making things happen, with his own money and with his work to raise funding for the Betagroup, to provide for all those free events for entrepreneurs and professionals. I still remember when I discovered the Betagroup and before attended my first event (number 3 of 37 so far, without counting all the seminars, workshops and conferences) I contacted Juanito who was running a Hispanic social network in the USA and had moved back to Belgium. He wanted to have an American style event to shake things a little and meet other like minded people. With the help of some of his friends he started setting up a dinner to discuss it and then moved to the ULB to host a growing community. I think that back then we were 80 or so, but for the next event it was already 100 and it has kept on growing. Today there are over 5500 people in our community of tech startup lovers. Thanks to Jean we are changing the world, starting with Brussels. The Betagroup has always strived to help startups grow, and one of its successes is Woorank, Jean’s own startup. In the last two years Boris Demaria and have grown Woorank into a profitable business, without external capital and to a 13 person strong team. He’s managed to turn his own dream into a reality. Woorank is growing fast and Jean needs to concentrate on this opportunity. The Betagroup will continue on operating just like it does now. I’ve taken over most of Jean’s role running the Betagroup and will be working with two great people that have already proven their value, namely Julie Foulon and Leo Exter. Julie will continue organizing the big events of the Betagroups, our pitch slams and demo days. Leo will continue running the Betainvest, our investor club where we try to help investors and startups meet each other and heat up the market. I will continue running the coworking space and will be more involved in the running of the Betagroup together with the other founders of the non-profit: Olivier Belenger and Julien Meganck. Jean has made sure that his parting did not hinder the Betagroup. Send Jean a message, by email, Twitter, blog, sms, through the Betagroup’s contact form, by post, in person when you see him… No matter how, but tell him about the positive impact he’s had on you, your company, your community. Thank him for this 4 years of hard work and support. It is the least we can do. Organize your own event or join the organization of an existing event. We build the ecosystem together. The more you participate the better, bigger and useful it gets. Let’s make sure that no matter who moves along with life the ecosystem keeps on growing and growing faster all the time.